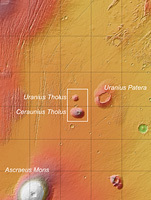 The Latin word “tholus” means a conical dome and the base of Ceraunius Tholus is 130 km across, while the peak rises 5.5 km above the surrounding plains. At its summit is a large caldera 25 km across. With similar morphology to its neighbour and lying 60 km to the north, Uranius Tholus is a smaller volcano, with a base diameter of 62 km and a height of 4.5 km. The flanks of Ceraunius Tholus are relatively steep, at about 8° inclination, and are etched with valleys. They are deeply cut in many places, suggesting that soft and easily eroded material, such as layers of ash, were deposited during the volcano’s eruptions. The largest and deepest of these valleys is about 3.5 km wide and 300 m deep. It terminates inside an otherwise unrelated elongated impact crater that happens to lie between the two volcanoes, and has created a fascinating fan shape of deposits. Although the source of the fan is still being debated in scientific circles, it may have been formed when material from a lava channel or tube was washed downwards by a melting ice cap on the volcano. Certainly, the summit crater – the caldera – is flat and smooth, so it may have contained a lake early in Mars’ history when the atmosphere was denser. It is also possible that the water was produced when volcanic activity melted buried ice lenses. An ice lens forms when moisture seeps below the surface and forms a frozen layer between the top ‘soil’ and the rocky layer below. The elongated crater between the two volcanoes is called Rahe. It measures 35 km by 18 km and is the result of an oblique impact by a meteorite. A smaller impact crater 13 km across can be seen to the west of Uranius Tholus. This one also formed after all the volcanic activity ended and served to cover the lower flanks of the volcanoes with ejected material, with the result that only the upper regions of the original structures are now visible.